I'm always looking for new ways to prepare pasta. 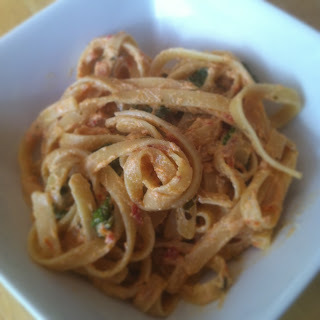 This sun dried tomato fettuccine was a nice change from your traditional fettuccine Alfredo. And much healthier! Cook pasta according to package directions. While pasta is cooking over medium heat saute garlic in olive oil large about 1 minute. Add in the sun dried tomato pesto and reduce heat to low. Combine Parmesan cheese, yogurt, and sour cream. Mixing well. Add mixture to the sun dried tomato and garlic. Let simmer for 8-10 minutes. Add in your spinach, salt, and red pepper. Toss in your cooked fettuccine and enjoy! This looks wonderful. I like all the ingredients. Thank you for sharing. I love sun dried tomatoes! This sounds very good! Very yum! Love a Weight Watchers recipe that involves pasta!